Two loaded guns were found in two days inside separate carry on bags at Mitchell International Airport. The guns never made it past security but one of the passengers could still face criminal charges. 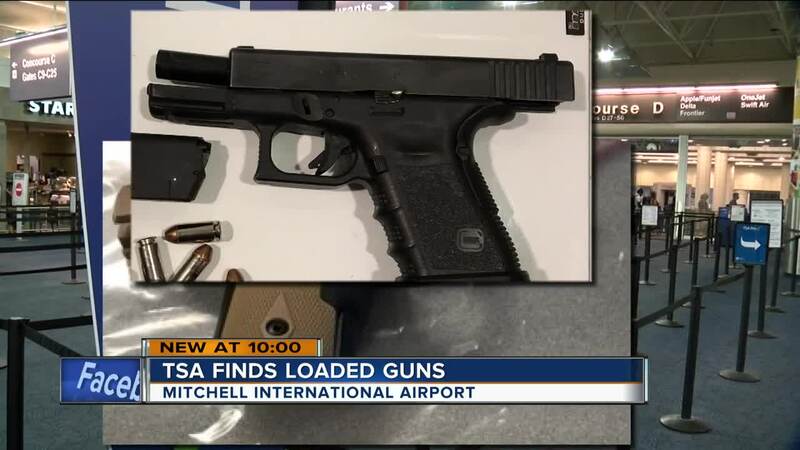 According to the TSA, one passenger brought a .40 caliber Glock, loaded with 13 rounds on August 21. The second passenger had a 9mm Kimber Micro in his bag on August 22. Both cases were referred to the Milwaukee County Sheriff's Office. A spokesperson with the department says one of the passengers had a valid concealed carry permit and was only cited. The second passenger did not have a valid permit and was taken to jail. Charges were referred to the Milwaukee County District Attorney's Office. The sheriff's office says both passengers said they forgot the guns were in their bags before going to the airport. According to the TSA, you can only travel with a firearm if it's in a checked bag that is declared to the airline at the ticket counter and properly packed in a locked, hard-sided container. The TSA has found six firearms so far this year at MKE, including the two found this week. Last year, TSA found 15 firearms in all. Across the country, the TSA has confiscated more than 2,700 firearms so far this year. Firearm parts, ammunition, and realistic replicas also have to travel in checked bags. TSA can fine passengers up to $13,000 for bringing firearms to the checkpoint. The average penalty for a loaded firearm is $3,900, and the average for an unloaded is about half that amount. More information about prohibited items at the airport can be found here.